If you're in the Seattle area and you'd like to try some candy experiments, come join me! I'll demonstrate some of our favorite experiments, including the Warheads Acid Test and Find Hidden Candy, with time afterwards for questions and book signing. Drop in any time and try some candy experiments at my signing table. A new experiment on Science Sparks tests what Fizz Wiz will do in oil, water, and vinegar. (Fizz Wiz must be about the same as Pop Rocks.) The results are interesting--they don't all pop! This looks like a great experiment to do with children who need to practice forming and testing a hypothesis. Find this experiment at the Science Sparks posting, "What Makes Popping Candy Pop?" For those who missed the Hearts Bobbing instructions on ParentMap and Parenting.com, here is the full experiment. To make conversation hearts bob, drop them in a bottle of club soda. 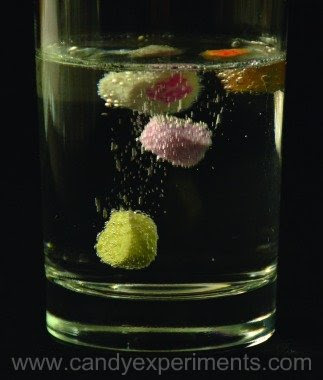 As the carbon dioxide in the soda forms bubbles on the hearts, the hearts bob to the surface, only to sink again when the bubbles come off. If you put the lid back on the bottle, the hearts will bob for a few minutes. Once they reach the top and start to stay there, gently shake or tap the bottle to knock the bubbles off and put the hearts back in motion. You can also do this experiment by pouring the soda into a cup and adding the hearts, or by using clear soda pop instead of club soda. and is copyrighted by Andrews McMeel Publishing. Happy Valentine's Day from Jelly Belly! When I saw these Jelly Belly Conversation Beans, I couldn't wait to try them out for Floating Letters, so I rushed home to put them in water. After the glaze with the printed logo got wet and started to loosen from the candy, I used a toothpick to gently poke through the glaze and tear off the piece with the letters. A few logos ripped in the process, but "LIKE" held together and floated nicely to the top. I've shared instructions for a fun Valentine's Day candy experiment on the ParentMap blog. Find out how to make conversation hearts bob up and down! "Buttery" Taste in Keebler Crackers? Since I started doing candy experiments, I read labels a lot more closely. Here's a new favorite from Keebler Multi-grain Club Crackers, which advertises that it has a "light, flaky, buttery taste, with the great taste of Multi-Grain." So I checked the ingredient label for butter. There isn't any. Instead, each cracker contains more than 10% "Soybean oil with TBHQ for freshness." And do you get any nutritional benefit from the whole grain in this "multi-grain" cracker? With more sugar per cracker than whole wheat flour, and less than 1 g fiber per 4-cracker serving, it looks to me like "multi-grain taste" is the only whole-grain benefit you enjoy. 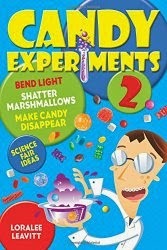 I'll be doing candy experiments at KidsQuest museum (Bellevue, WA) on Saturday at 11-12. Stop by and try experiments like finding "hidden candy" in the food you eat, see what happens when you drop a Warhead in water, and other fun science activities.